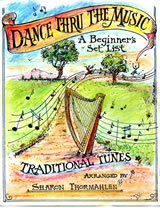 This book is a collection of English, Irish, Welsh, Scottish and American tunes arranged to the ability of the newer harp player. Tunes include: Southwind, Brian Boru’s March, Suo Gan, Country Gardens, Parson’s Farewell, Oh, Susannah, Oh, Shenandoah, The Shearin’s No’ For You, Down by the Sally Gardens, All Through The Night, Skye Boat Song, Morning Has Broken, Gander In the Pratie Hole, and Carrickfergus. The book also gives you a page of information about each tune that you can share with your listeners. Below is an excerpt Country Gardens from the book. I hope you enjoy it.